The Missionary Benedictine Sisters of Norfolk received an invitation to attend the celebration of the 150th anniversary of the founding of the Benedictine Sisters in Atchison, Kansas. Sr. Pia Portmann, Sr. Marita Schweiger and Sr. Pia Rottinghaus accepted the invitation and traveled to Seneca, Kansas where the celebration was held. 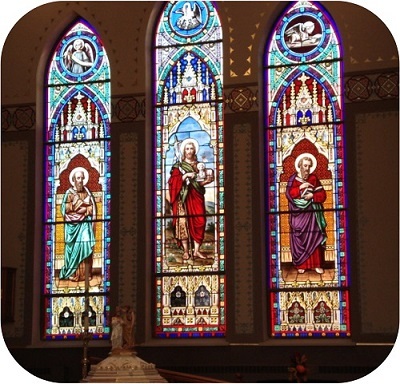 This is the home parish of Sr. Pia Rottinghaus and the first mission of the Atchison sisters. It is also the parish where two of the first Norfolk sisters helped the Catholic school in 1922 when they arrived in the USA and were guests of the sisters in Atchison. Sr. Pia Portmann and Sr. Marita traveled first to Atchison on Oct. 12th to visit friends and Sr. Marita’s cousins who are Benedictines there, while Sr. Pia Rottinghaus visited family in Seneca. The celebration Mass was held in the newly redecorated St. Peter and Paul Church where our first sisters would have worshipped. The Atchison Benedictine Sisters had come in a bus and tended to all the liturgy and songs. The offertory procession was done in a dance form with sisters bringing up the gifts. The readings were done by sisters who were born and raised in the Seneca area. More than 50 sisters in Atchison originated from this area. After the Mass there was a reception for everyone so people could meet and visit with many of their former teachers. With a four hour drive back to Norfolk, the sisters left soon after the reception.